Note: this will be the last bud stage report for 2014! Codling moth (CM) -- 1st generation, first sustained trap catch biofix date: May 20, Tuesday. Codling moth development as of May 20: 1st adult emergence at 1% and 1st generation egg hatch at 0%. 1st generation 3% CM egg hatch: June 11, Wednesday = target date for first spray where multiple sprays needed to control 1st generation CM. Lesser Apple Worm (LAW) -- 1st LAW flight begins around: May 16, Friday; Peak trap catch: May 25. Obliquebanded leafroller (OBLR) -- 1st generation OBLR flight begins around: June 11, Wednesday. Oriental fruit moth (OFM) -- 1st generation OFM fligth starts: May 9, Friday; 1st generation 55% egg hatch and first treatment date, if needed: May 325, Sunday. Plum curculio (PC) -- Increase risk of PC damage as McIntosh and similar cultivars increase fruit size: May 25, Sunday; Earliest safe date for last PC insecticide spray: June 4, Wednesday. San Jose scale (SJS) -- First adult SJS caught on trap: May 23, Friday; 1st generation SJS crawlers appear: June 21, Saturday. Spotted tentiform leafminer (STLM) -- 1st STLM flight, peak trap catch: May 16, Friday. 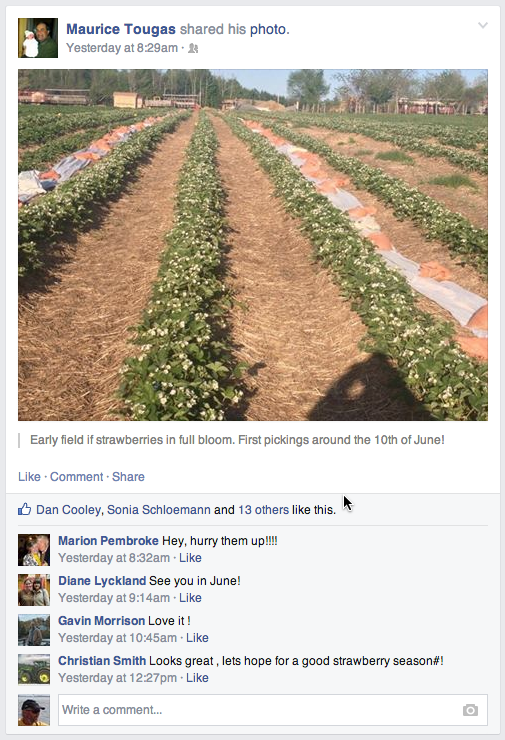 1st generation sapfeeding mines start showing: May 24, Saturday. Optimum sample date is around Sunday, May 25, when a larger portion of the mines are visible. 21-May, 2014 (Wednesday) Fruit Twilight Meeting at Alyson's Orchard, 57 Alyson's Lane, Walpole, NH (www.alysonsorchard.com). 5:00 to 8:00 PM. 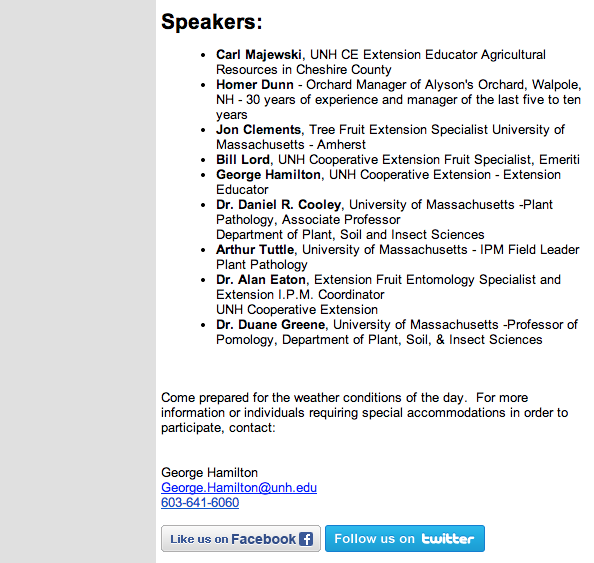 In cooperation with U. of New Hampshire Extension. 2 pesticide credits will be offered. Refreshments/snack will be served. Contact: George Hamilton, 603-641-6060. Also see below for further details. Maybe we will get through bloom someday. I am still having trouble seeing how things are going to shake out, however, it's pretty clear that sweet cherries are light (somewhat dependent on variety) as are peaches (ditto, however, we may end up with a near perfect crop with little or no hand thinning). I am going to have to wait another week to better assess apple fruit set. Insect appearance is pretty much right on schedule based on degree-days. I have caught copious Oriental fruit moth and now codling moth (in one night!) 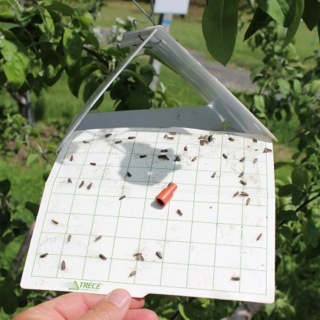 in pheromone traps at the UMass Orchard. Plum curculio are no doubt waiting in the wings, however, be very careful about applying any insecticide to trees until 95% petal fall to protect pollinating insects. Remember, apple fruitlets don't become particularly susceptible to curculio damage until they reach app. 7 mm. in diameter, and a petal fall application of carbaryl for fruit thinning has some insecticide activity agains curculio. 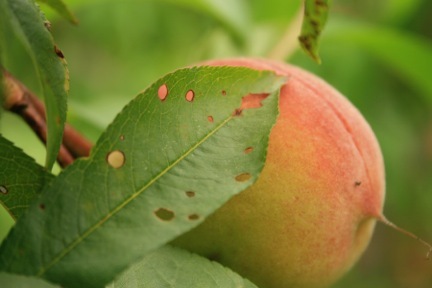 As soon as shucks slit in peach and nectarine apply an insecticide for plant bug and curculio. 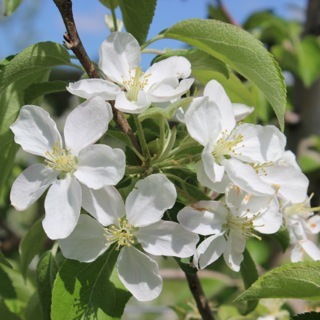 Consult the 2014 New England Tree Fruit Management Guide for all your insecticide options at petal fall. 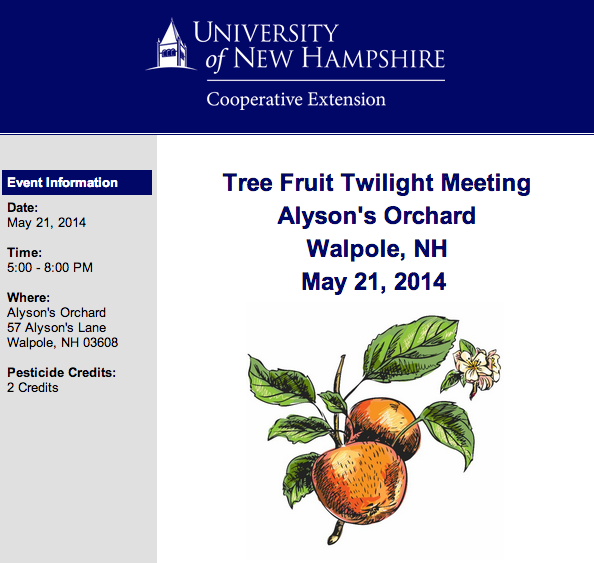 Growers in western Massachusetts (all others are invited too) should make the trip up the Connecticut River to Walpole, NH for the Twilight Meeting at Alyson's Orchard on Wednesday. It should be a good meeting with specialists from they Universities of New Hampshire and Massachusetts talking about the current status of insect, disease, and horticultural management. Hope to see you there. Call me (413-478-7219) if any questions. Note that there are two pesticide re-certification credits being offered. 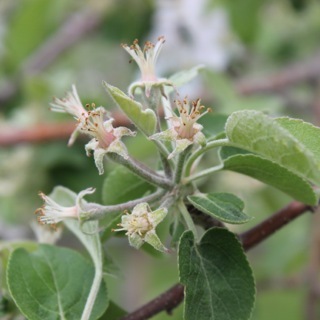 A tale of two apples: Liberty, on the left is approaching 6-7 mm king fruitlet size; Honeycrisp, on the right, is just going past full bloom into early petal fall. These two apple trees were side-by-side at the UMass Orchard on 5/20/14. I can't say for sure, but the king Liberty fruitlet looks like it might have already been probed by plum curculio. 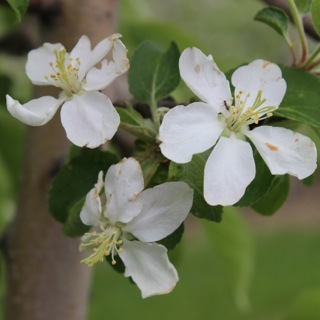 Clearly, you can't spray insecticide, however, on open bloom, such as the Honeycrisp. Apple scab update. Apple scab ascospores are still abundant. We have caught relatively large amounts of spores in recent rain events. In our lab tests, large numbers of spores have been released and are ready for release with the next rain. That all adds up to be ready to put on protection for the next rain. We still recommend a tank mix of a systemic and protectant fungicide at this time. Bacterial spot of peaches. 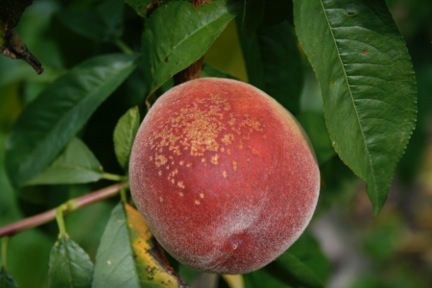 We have had increasing problems with bacterial spot on peaches in recent years. For future reference, the first two steps in managing bacterial spot are to plant cultivars that are relatively resistant. 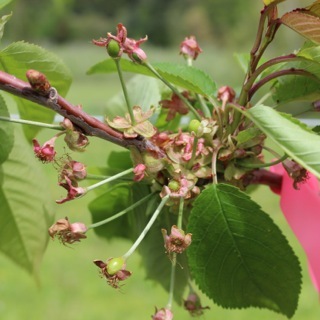 A list of cultivars with their susceptibility to bacterial spot from the New Jersey Commercial Tree Fruit Production Guide is available here. The second step is to use copper prior to bloom to reduce inoculum. Remember that for next season. 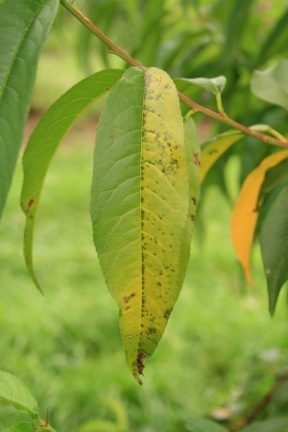 Right now, reduced rates of copper can be sprayed from petal fall through the summer to protect against bacterial spot, but copper can damage peach foliage. The more copper applied, the higher the risk of damage. The amount of copper in different tree-fruit products varies, and it is important to use the correct amount. Norm Lalancette of Rutgers recommends 0.5 oz/acre of metallic copper, which is much less than label rates for most products. For example, Kocide 3000 30 DF has a label rate of 4 to 8 oz/acre on peaches and nectarines post-bloom, while Lalancette recommends no more than 1.7 oz/acre. There’s a table in this article that gives rates of copper products for bacterial spot. Bacterial spot pressure is highest in wet weather. Copper sprays should be applied prior to wet weather, but should have enough time to dry. Applying copper to wet leaves increases the chance of injury. After shuck split an oxytetracycline product, such as FireLine or Mycoshield, is most effective against bacterial spot. For extended periods of wet weather, plan to use an application of oxytetracycline within 24 hours of the start of rain. Spray these products at relatively dilute rates for maximum efficacy. Use 1.5 lb/A of either FireLine or Mycoshield, and apply 100 gal/A. in general, mixes of two chemical thinner are somewhat synergistic, i.e., expect considerable more thinning than either used alone; Maxcel plus liquid formulations of carbarly can in particular be "hot"
by all means, required reading, read PGR's and Thinning Strategies GLEXPO 2013 (thanks Phil Schwallier, Michigan State University) when in your armchair tonight! Re-printed from Tree Fruit News, Vol. 2, Issue 4, May 15, 2014. Eastern NY Commercial Horticulture Program. In the Northeastern US, almost all apple orchards are chemically thinned early in the season each year using a combination of either Naphtaleneacetic Acid (NAA, a synthetic auxin plant growth regulator) plus Carbaryl or Benzyl Adenine (BA, a synthetic cytokinin plant growth regulator) plus Carbaryl. Carbaryl, which is a carbamate insecticide, causes some thinning by itself but also enhances the thinning efficacy of either NAA or BA. Carbaryl has been an essential component of chemical thinning programs for more than 40 years. However, there is concern that Carbaryl will be removed from the market by regulatory action either in the US or in Europe. 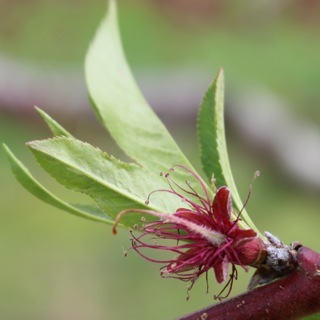 If Carbaryl were removed from the market, apple growers in the Northeastern US would not achieve adequate thinning with NAA or BA alone. In 2014, one US based supermarket chain has prohibited the use of Carbaryl on apples they purchase even though it is still a legal product. This will require growers who supply apples to this supermarket chain to do their chemical thinning this year without Carbaryl. We have been researching alternatives to Carbaryl for several years to repond to this possible scenario. This article details our proposed solutions to the problem. 1. 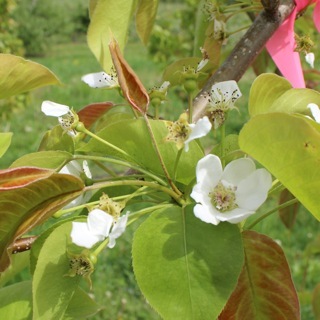 Multiple thinning sprays Probably the best approach to thinning without Carbaryl in 2014 is to use multiple thinning sprays beginning at bloom and then use the precision thinning protocol to measure progress toward the target fruit number after each spray. Thus, a spray program for a hard to thin variety like Gala could begin at bloom with a 2% spray of Ammonium Thiosulfate (ATS) or a 10 ppm spray of NAA followed by a petal fall spray of NAA+Maxcel, followed by a 10-12mm spray of NAA+Maxcel. A spray program for an easy to thin variety like McIntosh could begin at petal fall with a NAA+BA spray followed by a second spray of NAA+Maxcel at 10-12 mm. With good assessments after each spray using the fruit growth rate model growers could adjust rates to achieve the target fruit number. 2. Higher rates of NAA Thinning with NAA alone requires higher rates than when thinning with combination sprays of NAA+Carbaryl. A good rule of thumb is to increase the rate of NAA by 50% over the rate you have used when combined with Carbaryl. For example if you used 5ppm NAA+ Carbaryl last year on McIntosh, this year you should use 7.5ppm NAA alone. Likewise if you used 7.5ppm NAA+Carbaryl on Empire this year you should use 10ppm NAA alone. However very high rates of NAA can cause a temporary stunting of fruit growth and a negative effect on final fruit size. Thus, we recommend to not exceed 10ppm even though up to 20ppm will give more thinning. 3. Mixtures of BA and NAA BA alone is a weak thinner and requires very high rates for effective thinning. However, high rates (above 150ppm) can cause lateral bud break which we don’t want. Thus a high rate of BA alone is not a good solution. Carbaryl gives a synergistic effect with BA which is the reason the mixture of BA and Carbaryl is so useful. We have had very good success mixing BA and NAA for several varieties. 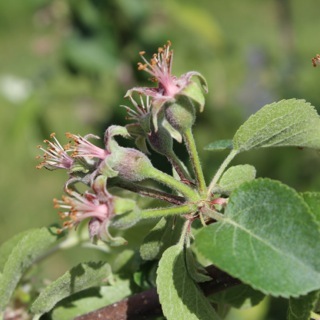 In one study (see reference below) we evaluated the mixture of BA and NAA on 12 varieties (Braeburn, Cortland, Delicious, Empire, Fuji, Gala, Gingergold, Jonagold, Jonamac, Liberty, McIntosh and Sansa). We had very successful thinning on 10 of the 12 but with Delicious and Fuji we ended up with numerous pygmy fruits from this mixture. For small fruited varieties like Gala, Empire, Jonamac etc., we recommend the combination of BA+NAA. Our studies indicated that 7.5ppm of NAA could substitute for the carbaryl. Thus if last year you thinned Gala with 75ppm BA+1pt Sevin this year you would spray 75ppm BA+7.5ppm NAA. 4. Additions of oil to BA Small amounts of spray oil (1pt/100 gallons) added to a spray of BA can increase thinning efficacy since the oil acts as a penetrant. With most BA sprays only a small fraction of the spray deposited on the leaf or fruit is absorbed into the plant where it can act as a thinner. Commercial BA formulations come with a surfactant already added to improve uptake; however more uptake can be achieved with oil. However, the use of oil carries its own risks of inducing russetting if Captan is applied shortly before or shortly after the BA+oil spray. This is especailly true if the BA+oil spray is applied when fruits are small (petal fall to 15mm) or following a frost. Thus, we give this urgent caution: do not use oil as a surfactant with BA if you are using a Captan program from petal fall to 15mm. The situation where BA+oil is most useful is with Delicious and Fuji where NAA causes pygmies. For these two varieties we suggest a thinning program that does not use NAA but rather BA. However, to get enough thinning response from the BA you must use some oil to get greater uptake. If last year on your Red Delicioius or Fuji you used 100ppm BA+ 1pt of Carbaryl this year you should use 100ppm BA+ 1pt of oil. 5. Additions of regulaid to NAA The use of regulaid (1pt/100) with NAA can significantly increase the thinning efficacy of NAA. The regulaid increases uptake of NAA in a similar manner to oil’s effect on BA uptake. The use of Regulaid is very common in WA State but not so common in NY State because of the risk of overthinning in some years and the risk of russetting due to increased Captan uptake when Captan is used shortly before or after a NAA spray that contains regulaid. Thus, we give the same caution as with BA+oil do not use Regulaid as a surfactant with NAA if you are using a Captan program from petal fall to 15mm. If Regulaid is used, it can essentially substitute for the carbaryl. For example if last year you used 5ppm NAA+Carbaryl on McIntosh, this year you could use 5ppm NAA+1pt/100 of Regulaid. Likewise if last year you used 7.5ppm NAA+Carbaryl on Empire, this year you could use 7.5ppm NAA+1pt/100 of Regulaid. Final Thoughts: For those who can still use Carbaryl, we continue to recommend sequential sprays with either BA+Carbaryl or NAA+Carbaryl. Mixtures with Carbaryl give the most consistent and effective thinning. I hope other supermarket chains will not prohibit the use of carbaryl since it is still a legal product and is such an essential component of effective thinning programs in the Eastern US. For those NY growers who must thin this year without Carbaryl, the options listed above should result in successful thinning this year if we are “lucky." Reference: Robinson, T.L. 2006. Interaction of Benzyladenine and Naphtaleneacetic Acid on fruit set, fruit size and crop value of twelve apple varieties. Acta Hort. 727:283-290. The next Healthy Fruit will be published on Tuesday, May 27 or thereabouts, 2014. As always feel free to get in touch with any member of the UMass Fruit Team (http://extension.umass.edu/fruitadvisor/team-members) if you have questions or comments.